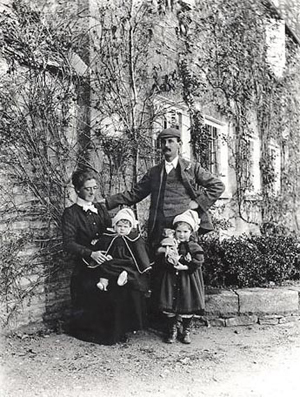 Sidney Howard Barnsley was born on 25 April 1865 in Birmingham, the son of Edward William Barnsley, of a family of builders and previously varnish makers, and Louisa Emily Hurt. He studied at the Birmingham School of Art and went on to the Royal Academy's Architecture School (1885-87). He was articled to the London architect Norman Shaw, a pioneer of the 'Old English' vernacular revival who emphasised the subtleties of craft detailing. The architectural theorist William R. Lethaby was chief assistant at Shaw's office when Sidney Barnsley worked there (in 1885). He had just completed his book on Hagia Sophia (1884) and encouraged the young Barnsley to visit Italy and the Near East to study at first hand "the very structure and anatomy" of the great Byzantine buildings, then enjoying a revival of interest. Barnsley was admitted as an architectural student to the British School at Athens in 1887–8, to work on Byzantine architecture in Salonica and Mount Athos as part of a project directed by Dr Edwin Freshfield, solicitor to the Bank of England and a trustee of the BSA. In 1890, he travelled again throughout Greece with Robert Weir Schultz (1860-1951), another student in Shaw's office, to make a systematic study of Byzantine monuments, preparing measured drawings of buildings and studies of mosaics and ornament. They found inspiration not so much in the massiveness and surface ornament of the Italo-Byzantine buildings admired by John Ruskin, but in the purer Greek prototypes. The boldness of their planning, the subtle articulation and play of light in their interior spaces, their surface decoration in wallpaintings, plaster relief, mosaics and bands of marble, all integral to the structure of the building, were a revelation after the well-worn experiments of the Victorian Gothic revival. Barnsley and Weir Schultz set up in practice together for a while at 14 Grey's Inn Square (1891). Dr Freshfield lived at Lower Kingswood in Surrey and had been a member of the committee which commissioned the Greek Orthodox church of Saint Sophia (later the Orthodox Cathedral) in Moscow Road, London (1882). Impressed by Barnsley's originality and enthusiasm, he commissioned him, aged 25, to design a church for the village. The result was the scholarly Church of the Wisdom of God [1890-2], also known as Santa Sophia, Barnsley's only church, a masterly experiment in the Byzantine revival. It has a small round apse and a wide tunnel vault enclosing surfaces whose decoration is integrated and uncluttered. The mosaics in the central apse are, like those at Owlpen, executed by James Powell & Sons of Whitefriars. The church has marble linings to the walls and incorporates artefacts and marbles from Balkan churches and nine ancient capitals from churches in Asia Minor, including Ephesus. Meanwhile Barnsley continued with his study of Greek architecture in the field. His collaboration with Weir Schultz resulted in the publication together in 1901 of an illustrated folio monograph on the monastery church of Osios Loukas at Daphne, set remotely on the north of the gulf of Corinth. The project was financed largely by Freshfield. Their academic exploration was not that of another fashion, but an inner affinity which aided them in uncovering the latent expressions of their own style. The book showed his talent as an original scholar and researcher, but architectual archaeology, as he termed it, was not a direction he was to follow and it remains his only published work. Schultz designed (1910) his most successful work in the Byzantine style, namely the mosaics for St Andrew's Chapel in Westminster Cathedral, paid for by another of their patrons, the 4th marquess of Bute. Sidney Barnsley contributed the kneelers and Gimson the chairs. Barnsley was by this time focussing his energies on on crafts. 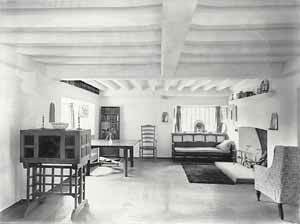 He had met the architect and designer Ernest Gimson, a pupil with his brother Ernest in the offices of John Dando Sedding. Together they were committed to the practical study of craft processes, in particular furniture making. 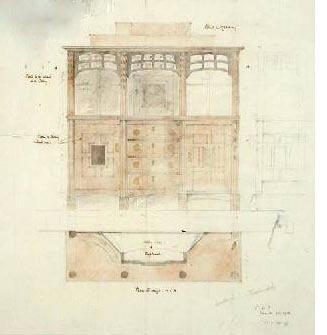 In 1890 they set up with Lethaby and other like-minded young architect-craftsmen the firm of Kenton & Co., a loose collective of furniture designers. Barnsley joined the Art-Workers' Guild in 1892 and after the Kenton & Co. project failed in the same year, the three determined to move to the countryside, with the idea of founding a Utopian craft community. 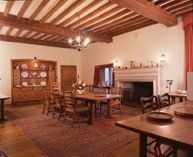 They soon settled on the estate of Lord Bathurst at Pinbury Park, a 17th-century house near Sapperton, a deeply rural part of the Cotswolds, in order to collaborate in the revival of traditional craft skills and village life. Sidney focussed on learning his craft as a cabinetmaker, developing it to the highest standards. He was more than the others a designer immersed in craft skills, a craftsman who understood design principles. As an innovator in design, he adapted traditions both from vernacular and eclectic classical precedents to new uses, and formulated in collaboration with Gimson and his brother Ernest the principles of the 'Sapperton' style in the years 1893-1900. The style emphasised the use of English hardwoods, exposed joints, chamfered members, decorative stringing and inlays. Barnsley's designs are monumental: less elaborate and spindly than Gimson's mature work, with its urbane elegance and restraint. They are robust, perfect in workmanship, subtle in constructional detail, almost Shaker in their rigour and spiritual purity. 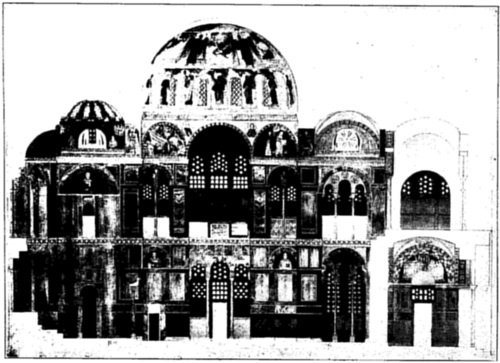 Deriving from his study of Byzantine buildings, he was interested in the use of structures which were themselves a decorative element, and restrained surface ornament in techniques of inlay, intarsio and gesso work which elaborated structure. In his working methods, Sidney Barnsley exemplified Ruskin's ideal of the craftsman who thought, the thinker who crafted: 'the worker ought often to be thinking and the thinker often to be working'. In character he was more diffident and high minded, more solitary and intellectual than the other members of the group. His younger collaborator Norman Jewson later described how Sidney lived by high ideals, to the extent that "austerity was almost a religion"; he preferred to make his furniture entirely on his own, without assistance, rather than to design for other craftsmen. His furniture is accordingly rare, and today Owlpen has a representative collection of his various styles, from the simple early farmhouse dresser in pine to elaborate 'state' furniture for rich patrons. He did not believe in delegating humble and unpleasant tasks to others; so that, Jewson wrote, "a great deal of his time was taken up by gardening and sawing and splitting wood for the winter fires." Barnsley had turned to furniture design when he arrived in the Cotswolds, and early architectural commissions had been few. They included Beechanger in Sapperton (for his own occupation) and St Chloe's (1911), Amberley (today known as Seynckley), for the artists, Henry Payne (who painted Owlpen) and his wife Edith. He undertook little architectual work through the war years, either. Only after Gimson's early death in 1919, did Barnsley turn increasingly to architecture. He had been involved from the beginning in Geoffrey Lupton's commission of 1911 for the memorial hall and library at Bedales School. Only the hall had been built, and Gimson revised his plans for the library in 1918. Barnsley then supervised the building work (1920-1) after his friend's death. The projects of his last years included Combend Farm (1921–5), where he compelted the remodelling for Asa Lingard; extensions for Arthur Mitchell at Glenfall House, Charlton Kings (c. 1923); the restoration of Painswick Lodge (1925–6); Rodborough Tabernacle (1925) and extensions to Cotswold Farm, near Duntisbourne Abbots, for Major Birchall (1926). He took over the project at Rodmarton Manor on Ernest Barnsley's death. He himself died nine months after Ernest on 26 September 1926, aged 61, when Norman Jewson in turn completed a number of his outstanding commissions. He had married aged 30 Lucy Evelyn Morley at Temple Bruer, Lincoln, on 25 April 1895. Their two children both continued in careers inspired by the Arts and Crafts ideals. Grace was a pottery designer and painter (see below). Edward Barnsley (1900-87) became a pre-eminent furniture designer, maker and teacher, continuing to work in the tradition of his father and uncle to the end of the 20th century. After attending Bedales School, he settled at Froxfield, near Petersfield, in Hampshire, where he was apprenticed (1919-22) to Geoffrey Lupton, a former pupil of Gimson's, eventually taking over his workshops in 1923. The workshop continues today under the auspices of the Edward Barnsley Educational Trust. Sidney Barnsley was a pioneer conservationist and active member of the Society for the Protection of Ancient Buildings. The advanced dereliction of the Old Manor House at Owlpen had been brought to his attention before the First World War, for his professional advice. He became an early champion of its rescue. Following the War, there were rumours that the old manor was to be done up and 'americanised', which the by then elderly owner, Rose Trent Stoughton, vehemently denied: "my hope is to restore the Manor house as a home for myself and my heirs". This of course means a great expense! A certain amount of damage is being done to the roof and the copings of the gables by the overgrown creepers; these should be cut back. Mrs Trent-Stoughton tried to sell the Mansion with several farms some weeks ago -- but there was no Purchaser and the caretaker told us that if the Mansion had been sold, Mrs T.-S. spoke of having the old house repaired and live in it herself... She is over 80! Mrs Trent-Stoughton ... is a very old Lady and has always taken great pride in her old house and probably more repairs would have been done during the War but for the cost & difficulty -- and her trying to sell her Property apart from the old House may show that she is finding her income much reduced. It would be fatal if the old house were ever again used as a dwelling place as the alterations and repairs that would be necessary would mean its ruin -- except of course if it was taken in hand by Weir & somebody would be found appreciative enough to sacrifice modern ideas of comfort! We also visited this very interesting old manor house with its original terraced garden and clipped yew trees (published by Country Life a few years ago), belonging to Mrs Trent-Stoughton who lives in a big modern mansion nearby. The house has not been inhabited for many years save by a caretaker in the kitchen part and the owner has always done her best to preserve the house from falling into decay, but during the War there is no question that repairs have not been done that should have been, though the stone tiles have been patched in places where the rain was getting through (but we gathered from the Caretaker that there are still places where the rain comes through). Several of the rafters are broken and the whole of the timbers are very worm eaten and rotten, so that there is a danger of parts of the roof falling in at any time, and to make the roof really sound and weather proof, it would be necessary to strip the tiles, strengthen the main timbers where necessary and insert new rafters and re-lath and at the same time cut out some serious cracks in the walls and bond properly. It is fortunate that Sidney Barnsley lived to see an "appreciative" architect like Weir -- in fact, Norman Jewson, who was at various times a colleague and friend of both Barnsley and Weir -- take on and complete Owlpen's repair shortly before his death, aged 61. The glazed bookcase in stained and figured oak with ebony stringing was made at the Sapperton workshops in about 1909. The design is based on seventeenth-century book 'presses', such as those made for Samuel Pepys now in the Magdalene College library, Cambridge, where Gimson worked through Sir Sydney Cockerell. It was commissioned by C.H. St John Hornby (1867-1946), a leader in the private press movement, the revival in fine printing inspired by William Morris's Kelmscott Press. He was founder of the Ashendene Press and partner in the firm of W.H. Smith & Son. He was a friend of Sir Emery Walker, the typographer, who founded the Doves Press with T.J. Cobden-Sanderson (who is said to have coined the term 'Arts and Crafts') in 1900 and lived from 1923 at Daneway House, the house near Sapperton where Gimson and Barnsley had their workshops and exhibited their work. It is the work of these two presses which "secured for the plain unadorned type face its place in modern book production" (Nikolaus Pevsner). 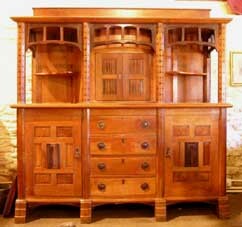 The settle is a characteristic Arts and Crafts revival of traditional forms. Inspired by traditional farmhouse settles, it shows the design principles of the Cotswold Arts and Crafts movement in one of Gimson's treasured pieces. Made of local quarter-sawn oak and with a coved top, it has decorative bands and diapers of simple chiselled gouge-work (similar to those on a chest at Froxfield, Hants), and the constructional joiners' tenons 'honestly' displayed. Norman Jewson subsequently acquired it (at Emily Gimson's sale in March 1941) for his own cottage at Sapperton. The first design for this fine English walnut and ebony writing desk (in the Cheltenham Museum 1972.187.81) is dated Feb. 1913. It is one of Barnsley's masterpieces, described by furniture makers as an "epiphany of technique and skill". 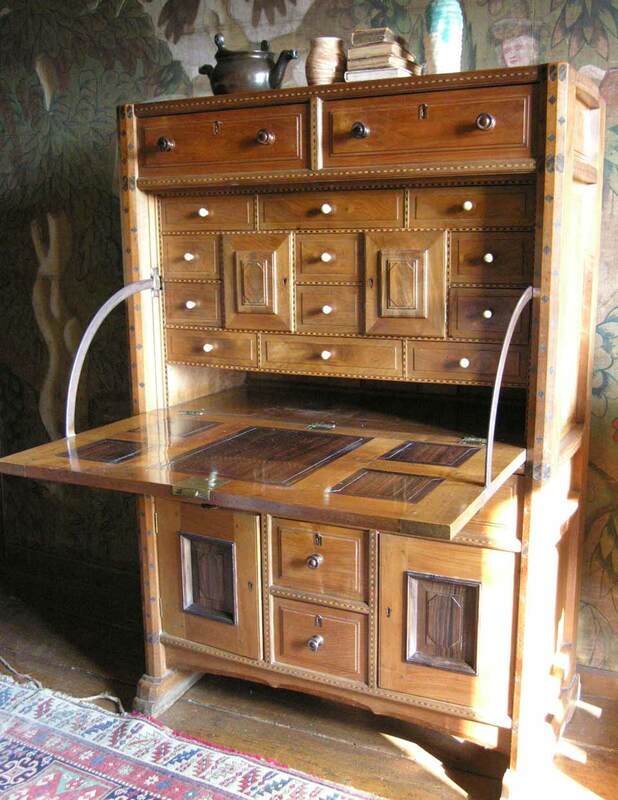 It is based on a re-interpretation of the William and Mary period fall-front secretaire cabinet. The front opens on tooled quadrant hinges, enclosing twelve drawers and ebony cupboards. The finish has holly stringing, moulded octagonal panels in Macassar ebony, bands of gouge-work diapers, exposed dovetails forming patterns, turned ivory handles and the typical stepped sledge feet of the Gimson school. The raised and fielded panels of the sides are solidly framed by flat-chamfered stiles in the form of posts, inlaid with lozenges of ebony, recalling Barnsley's interest in Byzantine prototypes. Even the back is carefully finished with ten raised panels in moulded frames. This large cupboard of English walnut and ebony is a lavish piece of later Barnsley furniture, finished and detailed to the highest standards. 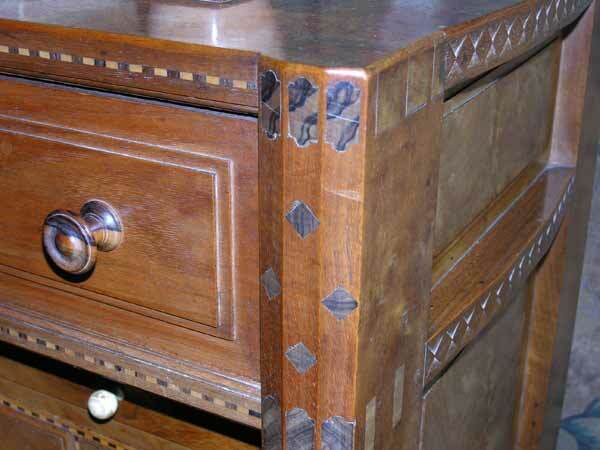 It has fielded ebony panels with holly inlays, through-tenons, and beautifully fitted doors and drawers. Octagonal posts frame a fret frieze, finished in chiselled gouge work, to the upper stage. It deploys motifs used by the wainwright, where the chamfers reduce weight, as described by the country writer, George Sturt. The centre of the base stage is set in a canted plan. completed work was invoiced on 10 December 1913 for £70. 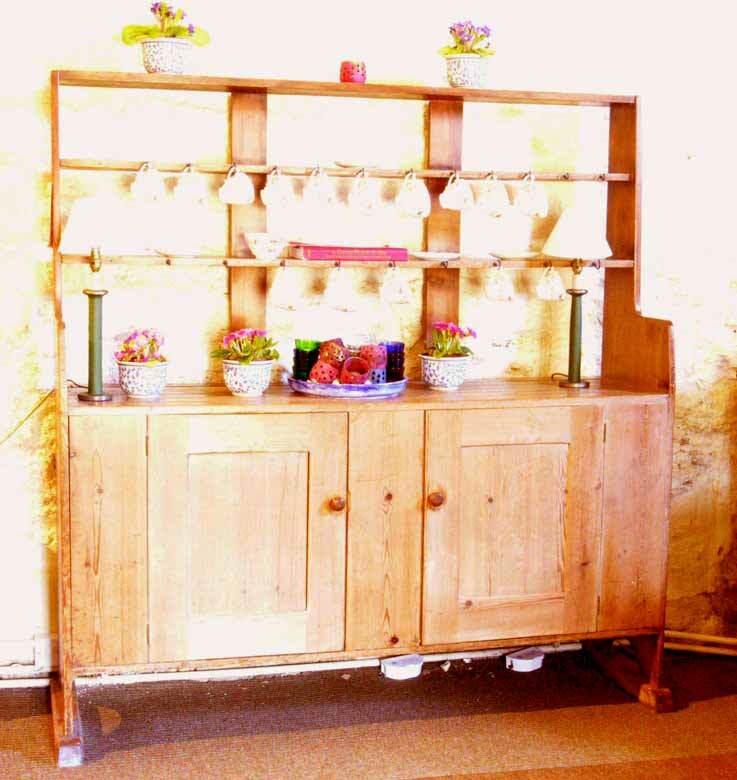 A simple kitchen dresser in pine from Barnsley's own Sapperton cottage contrasts with the cupboard. It illustrates the ideals of the Arts and Crafts designers to create "good citizen's furniture ... well made to the last degree" (Morris). 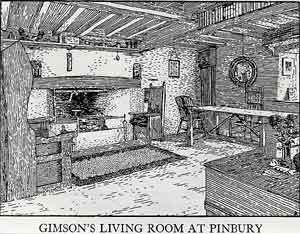 Gimson's aim was to produce this "cottage-type furniture at a price that working-class people could afford to pay" (Jewson). These early, functional pieces are rare as they were not economic, their established clients preferring to commission quality pieces finished in veneers, inlays and exotic woods -- ebony, satinwood, walnut, burr elm -- now associated with the movement. The dresser, like the settle, was a type of piece much loved by Arts and Crafts designers for its homely associations, and Gimson and the Barnsleys designed many different versions (Good Citizen's Furniture). 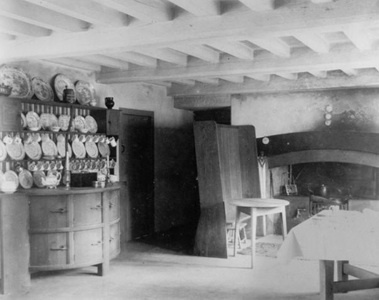 The dresser belonged to Sidney Barnsley, then to his daughter, Grace. Emily Grace Barnsley (1896–1975) was educated at Bedales and the Birmingham School of Art and became a pottery designer of distinction. 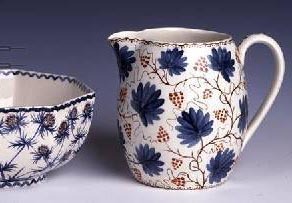 She was a pupil of Alfred and Louise Powell and became a freelance pottery designer and decorator for Wedgwood in the Twenties and Thirties. She married Oscar Davies in 1926 and moved to Rainham in Kent in 1934. Here in 1938 they started the Roeginga Pottery, where they made and decorated their own pottery to the outbreak of the War in 1939.